Spinocerebellar ataxias (SCA) are a group a rare neurological disorder characterised by abnormalities in the gait and movement. This rare genetic disease occurs at an estimated prevalence of approximately 2 per 100,000 individuals. Of the different types of SCAs, different populations have different types of SCAs. SCA type 3 otherwise known as Machado Joseph Disease (MJD) is one of the commonest of the type globally, while presenting rarely in India. Apart from coordination and balance, patients suffering from this disease have abnormal movements, including during sleep apart from loss of sensation of the limbs, progressing to muscle weakness and difficulty to even swallow food. The typical age of onset is around 18-60 years and the affected individuals are incapacitated in approximately 5-20 years. The disease is a peculiar one of its kind, caused by changes in the number of tandem nucleotide repeat sequences in the genome. In SCA3, the abnormality occurs in the ATXN3 gene. While normal individuals have usually less than 31 repeats of CAG, disease is caused by an increase in the number of the CAG repeat in ATXN3 gene beyond 45 repeats. A number of families belonging to a close-knit community were suffering from the disease in Buldhana. Buldhana is a district in the Vidharbha region of the Indian state of Maharashtra. The district is approximately 500 kilometers from Mumbai, the major metropolitan city and financial centre of India. The small district has an estimated population of around 0.6 million people. CSIR-IGIB has a long history working in the area of neurodegenerative diseases, including Spinocerebellar Ataxias in India. CSIR-IGIB also hosts one of the most comprehensive resources globally for genetic mutations in Spinocerebellar Ataxias. On request of Mr Harshwardhan Sapkal, the member of Legislative Assembly representing Buldana in the state legislature, we visited the region for studying the disease. Genetic analysis of the index families enabled through GOMED confirmed the diagnosis of Spinocerebellar Ataxia Type 3. Our intervention revealed the hidden burden for the disease. The disease burden in one single village was greater than all the total cases for the disease seen in AIIMS in the last 2 decades. Our study revealed approximately over 100-200 families are expected to be affected with SCA3/MJD in Buldhana. We hope screening of around 50,000 people of the community would provide immense benefits to the community, which we hope to undertake with adequate support. Apart from offering precise diagnosis for the community, the GOMED programme has offered a new ray of hope for the community. CSIR Institute of Genomics and Integrative Biology (CSIR-IGIB) with its rich expertise in the area of genomics and a wide network of clinical partners across the country has embarked on a unique outreach programme, to enable equitable access to genetic testing for frequent genetic diseases. This programme aims to provide a platform for clinicians to tap into the rich and varied expertise of CSIR-IGIB in disease genomics to solve clinical problems. The Institute brings to table its pioneering expertise in genomics in the country, demonstrated over almost a decade through the Indian Genome variation project, the sequencing of first Indian personal genome and ongoing clinical genomics efforts in rare and common diseases with a large number of public and private healthcare institutions in the country. 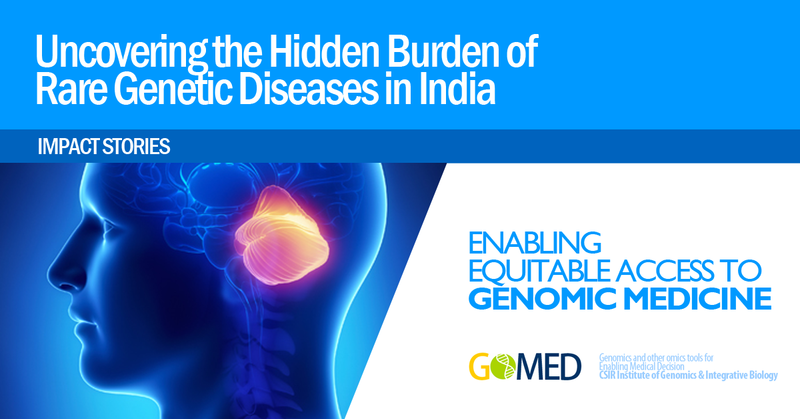 Through this effort, we make available this in-house expertise to a larger community of clinicians to enable precise diagnosis and prognostication of genetic diseases in India. The programme is widely sought after by clinicians and over the short span of one year has been able to provide accessible genetic testing for over 500 patients who otherwise could not have afforded the costly tests. We endeavor to constantly interact with our network on social media. are on Facebook @RareDiseaseIndia. You could also use the hashtag #RareDiseaseIndia on Social Media to tag us. CSIR Institute of Genomics and Integrative Biology (CSIR_IGIB), Delhi.